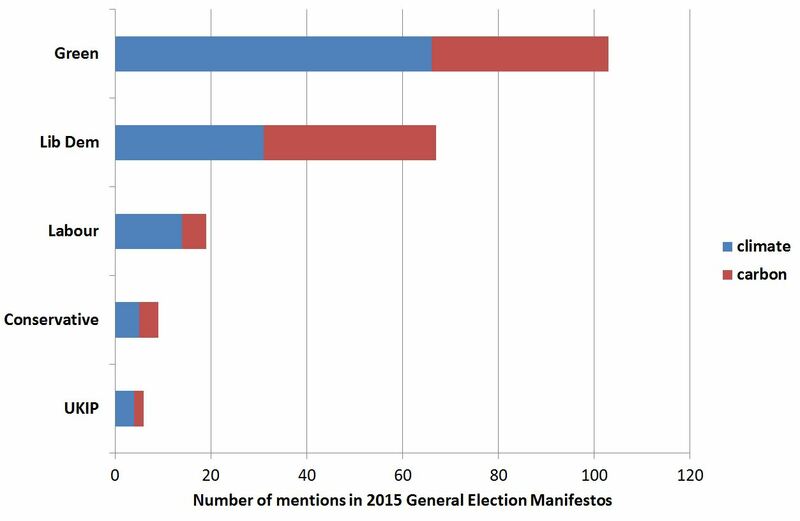 Comparing manifestos for May’s UK general elections highlights important similarities as well as differences among the parties. All of the manifestos published by UK-wide parties make reference to climate change policy, but to greatly differing extents. The chart below shows the number of times the various manifestos mention “climate” (in the context of climate change) and “carbon” (in the context of carbon targets or a low carbon economy). The number of references ranges from a mere 6 by UKIP to over 100 by the Green Party. The total number of references broadly matches the extent and ambition of each party’s policies for emissions reduction. UKIP’s references to climate change are in the context of their policy of abolishing the Climate Change Act. In contrast, the Conservatives continue to support the Climate Change Act with its legally binding obligation of an 80% cut in emissions by 2050. Labour go further with a specific binding target for decarbonising the power sector by 2030, and a commitment to push for a goal of net zero global emissions in the second half of this century. The Liberal Democrats seek a net zero carbon UK economy by 2050 alongside a binding power sector target for 2030. The Greens seek an even more ambitious binding target for the power sector in 2030 (25-50g/kWh vs. 50-100g/kWh preferred by the Liberal Democrats), along with a zero carbon economy by 2050, and a 90% reduction in emissions from 1990 levels by 2030. It should be noted that some these targets will be difficult to achieve, and perhaps impractical. A net zero carbon economy, for example, is likely to require substantial deployment of negative emissions technologies such as biomass with CCS or use of international offsets. A 90% reduction in emissions from 1990 levels by 2030 requires huge and relatively rapid changes to long-lived infrastructure, and will not be made any easier by the Green Party’s commitment to phase out nuclear power within ten years. The Greens have ambitions to reduce energy demand by half by 2030 and two thirds by 2050, including through a huge programme of building insulation. They also seek very large scale investment in renewables, and plan a system of individual carbon quotas. The fine detail of these policies is not spelt out, but one would not expect an election manifesto to set out a full and specific implementation plans. Despite the differences, there is very welcome common ground among the parties (UKIP apart). All support at least the targets in the Climate Change Act. All support international action, including an ambitious international agreement to reduce emissions. All support adaptation to climate change. This is encouraging, in that it represents the prospect of continuing progress whoever (other than UKIP) is in power after the election. Indeed as recently as two months ago the three main party leaders signed a joint pledge on climate change, including an agreement to work across party lines on future carbon budgets. Delivery on all these promises will of course be the crucial test. But in the meantime the amount of common ground between the parties continues to be encouraging. Note for non-UK readers: The Conservative Party is the largest party in the current governing coalition. The Liberal Democrats are the smaller party in the coalition, but the Secretary of State (senior minister) for Energy and Climate Change is a Liberal Democrat. The Labour Party is the main opposition party. The Green Party and UK Independence Party (UKIP) currently have very few Members of Parliament (1 and 2 respectively) but opinion polls show them each having significant support. This entry was posted in Climate change policy on 17/04/2015 by adamwhitmore.